New Bright has released quite a number of Dodge Ram RC trucks, and most of them look pretty much the same in pictures. One major difference between models is the size. This here is the 1/15th scale version, and it's about a foot long. There is some variation even amongst the 1/15ths, though! The specific one I bought was a Wal*Mart exclusive version which uses 5 AA batteries (not included) for the truck. There is another version out there that includes a 6V rechargable battery pack and charger! Either way, with a minimum user age rating of 5, this big-tired monster truck is aimed at the really young crowd, which explains the huge crash-proof bumper and extra high-riding style. The controller is a good size for younger hands, too. I know that when I was a 5 year old kid I would have wanted a truck that looked exactly like this. The body is a pretty realistic replica of the real thing, the wheels look slick without being overdone, and the tires, though they're made of a pretty hard, plasticky compound, at least look just right for a little off-road fun. Most kids run their RCs in driveways and on sidewalks, patios, and blacktop, so I started my testing on some flat asphalt. There, the New Bright Dodge Ram 1/15th scale RC performed delightfully well and I had zero complaints. Top speed was perfect for its targeted age range, and steering was pretty responsive. With that test completed successfully, I moved on to some dirt to try out the off-road capabilities. There it was slower, predictably, but still very usable. It could get over normal bumps & such without much trouble, and was able to make it up small inclines without grinding to a halt. What it couldn't do was get over rocks that were as tall as the ground clearance under the truck. Not surprisingly, it would get stuck, and have to back up. It also didn't take steep inclines very well, nor could it take on really rough terrain with an exceedingly rough surface. 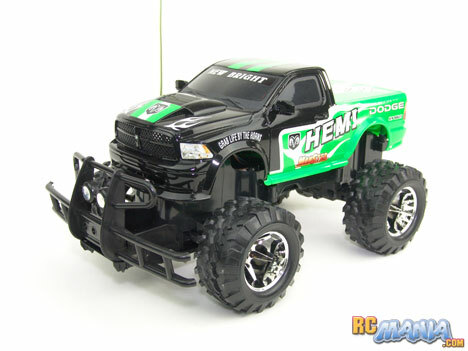 The New Bright RC Dodge Ram 1/15th scale is not a bad truck for the price and target audience. If you want one, be sure to look for the version that comes with a rechargable battery pack and charger already in the box. It should be about the same price as the one I got, making it a much better value. The truck is respectably fast on "street" conditions and is actually capable of going over real dirt & gravel. For about $30 (again, find the one with the battery & charger! ), it's money well spent for a younger kid.